Read about guidelines for autoclaving biohazardous waste. Follow San Diego County's regulatory guidelines when autoclaving biohazardous waste as designated in a regulatory permit. If not specifically designated, biohazardous waste should be disposed of via campus Hazardous Waste collection. Note: Only properly trained staff may use autoclaves. 1. Ensure autoclave permit is up to date and test before use. Autoclaves can sterilize and decontaminate laboratory materials. 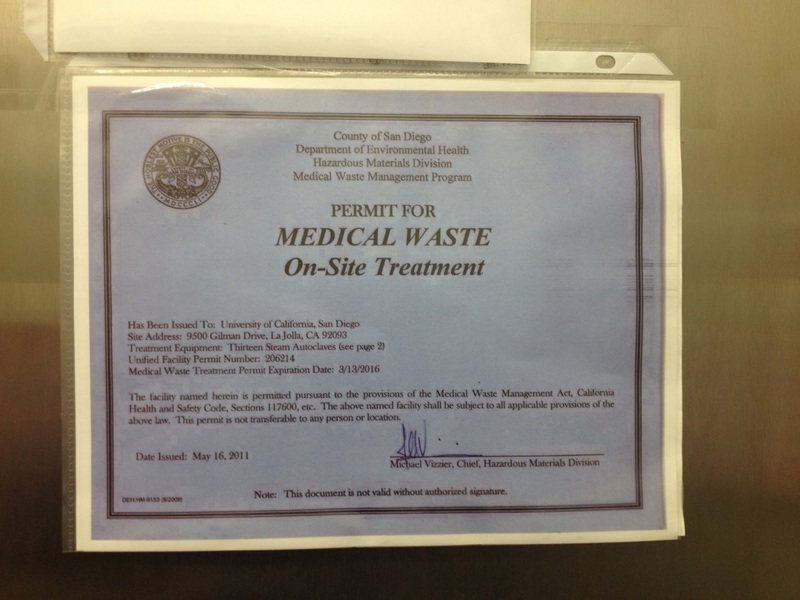 However, only a few UCSD autoclaves are calibrated and permitted by San Diego County to process biohazardous waste. Look for the permit that designates the autoclave to be used to treat biohazardous waste. Check that a spore test to indicate proper sterilization was done within the last 30 days. Follow the directions that are provided with the Bacillus stearothermophilus spore test vials to ensure proper procedures. 2. Check the autoclave's drain screen. For efficient heat transfer, steam must flush the air out of the autoclave chamber. If the drain screen is blocked with debris, a layer of air may form at the bottom of the autoclave and prevent proper operation. Check the drain screen at the bottom of the chamber before using the autoclave. Clean out any debris. 3. Prepare and label bags of dry biohazard waste. Read How to Package and Dispose of Biohazardous and Medical Waste for detailed instructions on how to prepare Biohazardous and medical waste. 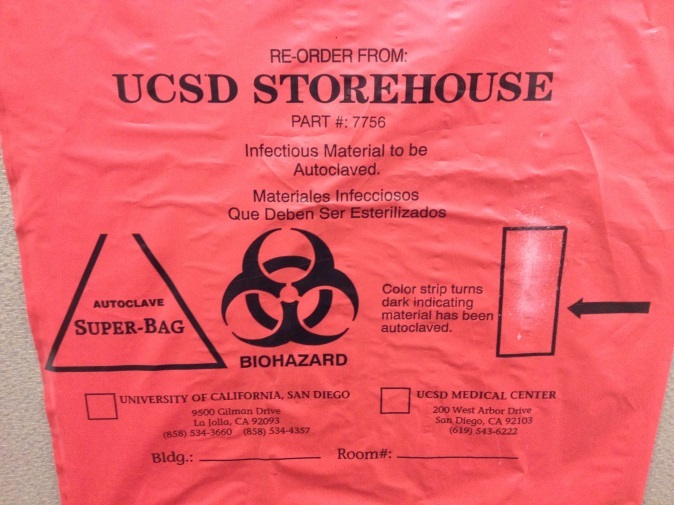 Red biohazardous waste bags premarked with the UCSD address and indicator strip are available from Core Bio Services and the Chemistry Storehouse in Urey Hall (see photo). Fill bags only half full and close loosely leaving a 1-inch opening to ensure adequate steam penetration. If the bags don't have an autoclave indicator place autoclave indicator tape on the front of the bag. 4. Prepare and label biohazardous sharps containers for autoclaving. Sharps are devices or objects with corners, edges, or projections capable of cutting or piercing skin or regular waste bags. Read How to Dispose of Sharps for detailed instructions on how to package and label sharps in a red biohazardous sharps box. Place autoclave indicator tape on the front of the sharps box without covering the label. 5. Use secondary containment for all items being autoclaved. Polypropylene or stainless steels tubs are typically used for secondary containment. Make sure your plastic container is suitable for autoclaving. Plastic types can be identified by looking for initials imprinted on the bottom of the container. If you are unsure about a new container, place it in an autoclave-safe container the first time. Examine containers for cracks, which may cause autoclaved biohazard waste to spill onto the operator. Select a container with the lowest sides and widest diameter possible for the autoclave. Leave space between items to allow steam circulation. 6. Do not autoclave these items. Warning: Do not autoclave bleach solutions as they can produce toxic gas. 7. Autoclave the load immediately after preparation. Never leave items in the autoclave overnight. 8. Close the autoclave door securely. Be sure the door is sealed before selecting the cycle. 9. Confirm temperature and set decontamination time. Temperature: Sterilizing cycle temperature must be at least 250°F (121°C). 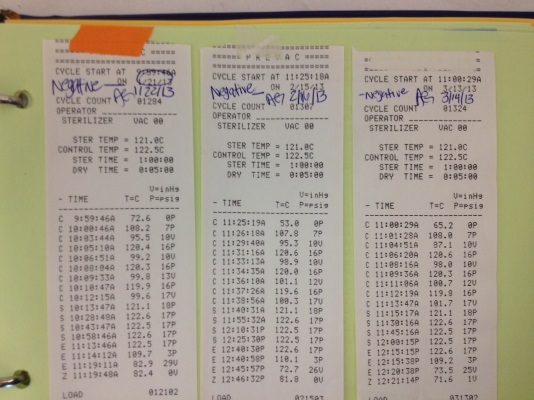 Time: The sterilizing cycle must be at least 30 minutes. 10. Choose the correct cycle type and start the autoclave. Select the liquid cycle (also called "slow exhaust" on some machines), as required by San Diego County regulations. Push the "start" button on the control panel to initiate the cycle. 11. 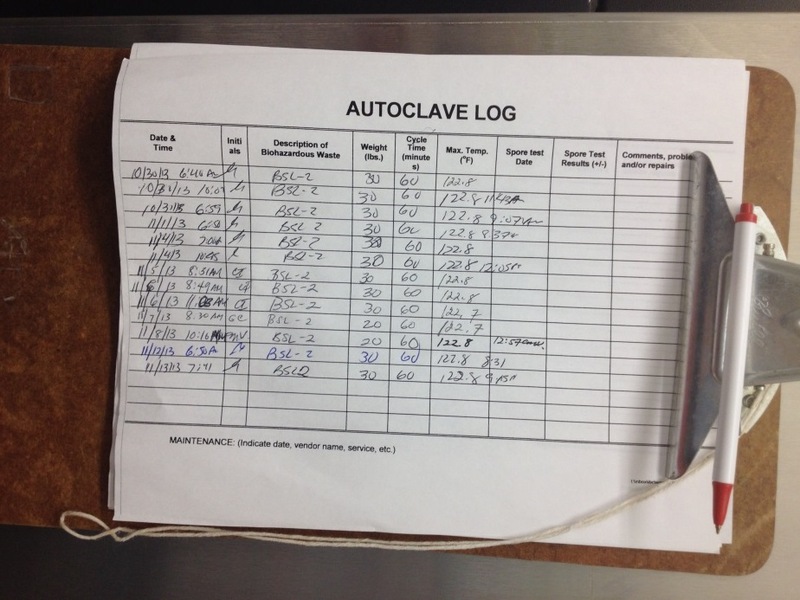 Fill out the autoclave log. Each machine must have an autoclave log (PDF) (Word) where the operator records the date, time, type of waste and container, weight, cycle time, temperature and pressure for each autoclave cycle. 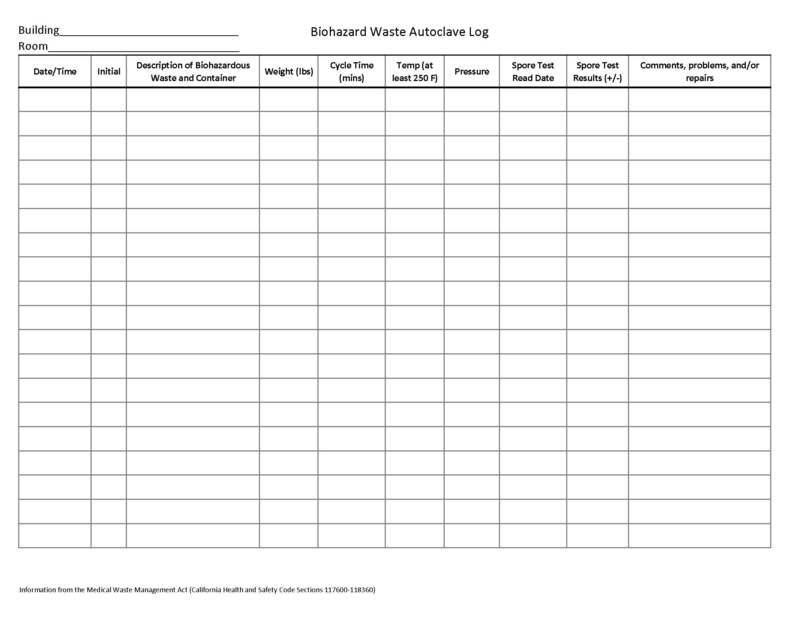 Fill out the log while the autoclave is "charging," or starting. 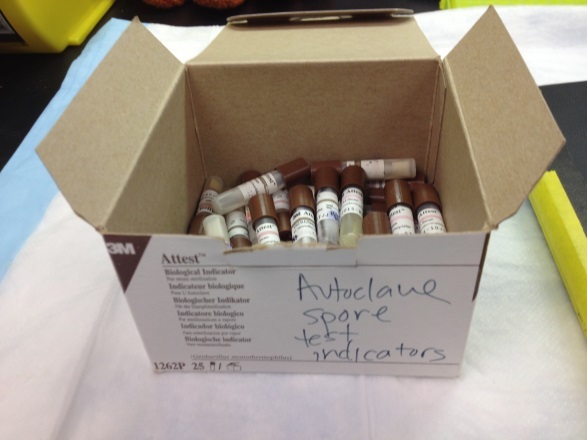 Ensure that the monthly spore tests are documented on the autoclave log. All test records and spore test vials must be kept on record for 3 years. 12. Check for proper cycle temperature and run-time. If the running time or the temperature is incorrect, rerun the load. 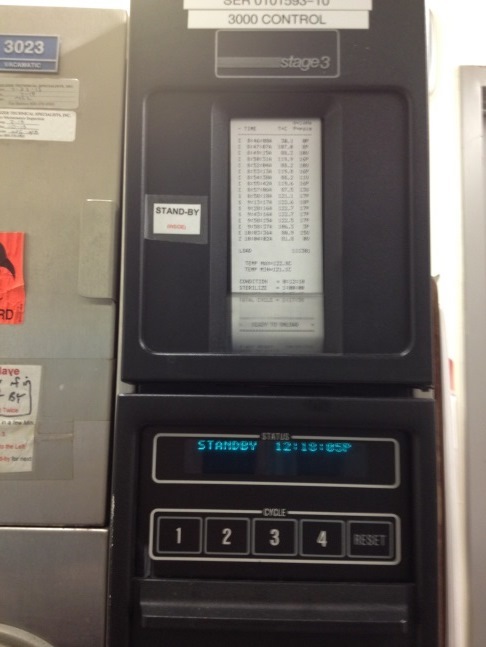 If the autoclave fails to maintain the correct time or temperature again, contact Facilities Management, (858) 534-2930. 13. Follow these precautions when the autoclave cycle is finished. Wait for the pressure gauge to drop to zero with zero time remaining before opening the door. Never open an autoclave set for "slow exhaust" until the cycle is complete. Superheated liquids can boil over and damage the autoclave and injure the operator. Open the door cautiously. Stand behind the door and slowly open it. Allow all steam to escape before reaching inside. Let liquids stand another 10–20 minutes after the autoclave is opened to avoid any movement that could cause them to boil. Remove items carefully. 14. Properly dispose of waste. Remove autoclaved waste immediately after the cycle is completed. Never leave items in an autoclave overnight. Place the red bagged autoclaved waste in your department's designated biohazardous waste collection area. For more information, contact EH&S Biosafety. 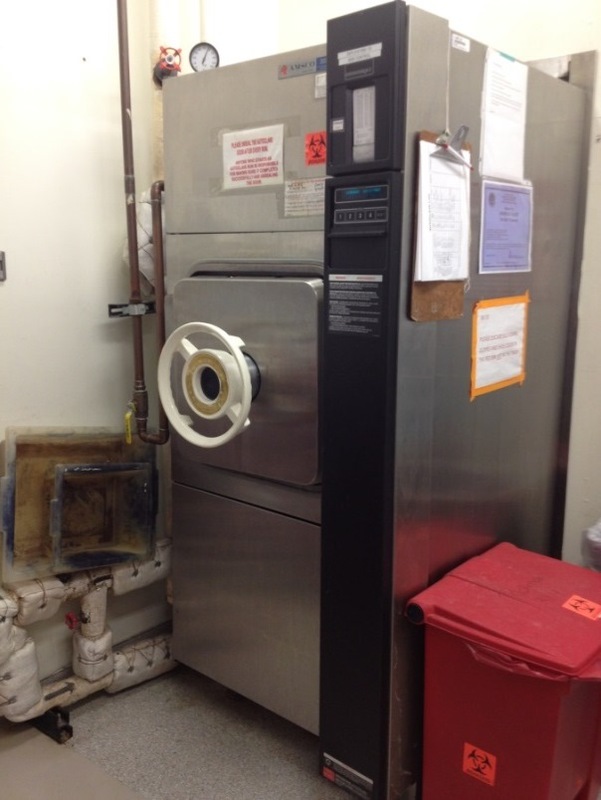 If an autoclave fails to work properly, contact Facilities Management, (858) 534-2930.